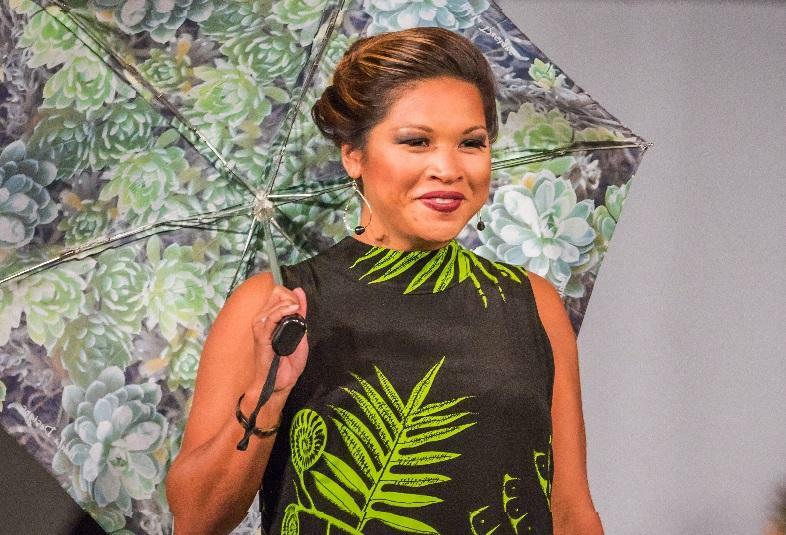 Nita Pilago, center with lei, designer and founder for Wahine Toa onstage after her models presented her 2016 collection at the MAMo Wearable Art Show 2016. Catching up briefly with Nita Pilago, founder and designer of the Wahine Toa clothing line. Nita Pilago. Wahine Toa from the 2016 collection. 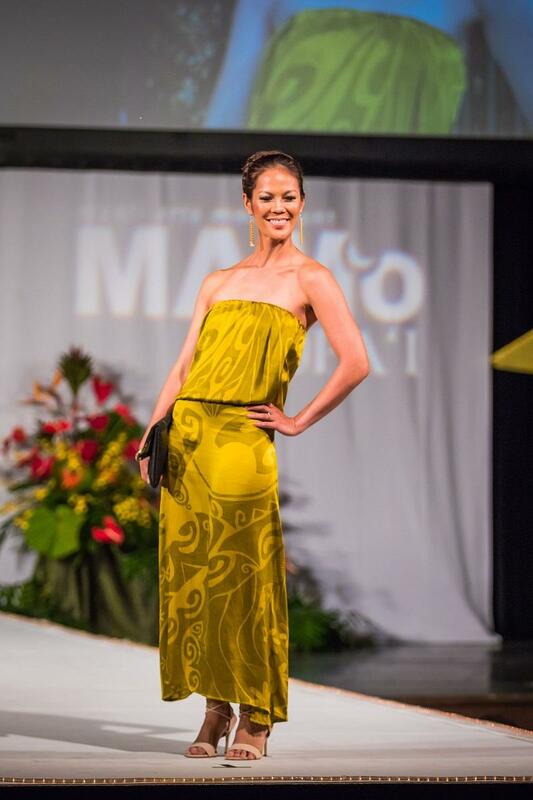 The MAMo Wearable Art Show, featuring Hawaiian designers, happens Wednesday, May 17th, 2017 at Hawai‘i Theatre, and at the MACC on Maui on June 17th, 2017. Related MAMo fine art exhibitions continue at the Pa’i Art Gallery at Ala Moana Center and at Marks Garage. Nita Pilago’s line of clothing, Wahine Toa, began about eight years ago, at her home on the Kona side of Hawai‘i island. Her husband, Angel, and her sons Kaleo and Che all contribute art work for fabrics that are printed and sewn in Bali. I first met Pilago at a Maoli Arts Market on O‘ahu several years ago. Rather shy, she mainly stayed in the background while her daughter and I enthused about how versatile Wahine Toa designs are. Pilago is the same today, her easy care dresses still go from extra small to 6X, and her prices are nearly the same too. Men’s wear, though, is new, a sellout at Merrie Monarch recently. Pilago may sell online soon, but everyone knows to call and stop by her garage in Kona. Nita Pilago. 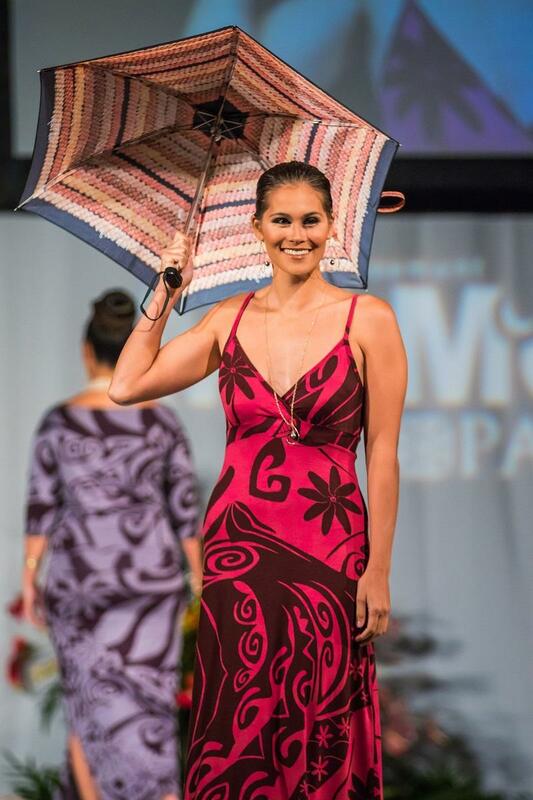 2016 Wahine Toa Collection as seen in the 2016 MAMo Wearable Art show. Pilago: I do my concept, everything, think about the production, development, my vision everything, my prototypes from my home in Kona. The art of course, is done by myself, my husband, Angel, my son Kaleo and my son Che. All four of us contribute to the art of my clothing, my line. So that’s a fun part of the designing too, using my family art in the whole process. Pilago: Once the prototype’s done here, we take it over, and sometimes I Fedex it so we start Fedexing back and forth until the product is what I want. And it’s fast, only takes four days. This is an easy relationship you have with the workers in Bali? Pilago: Oh we have. I’ve been working with the manager of my company since day one. He has evolved, we all evolved and we grew like family members. It’s so nice because they live spiritually so I had to learn all of their holidays because nobody’s going to work on a spiritual holiday. Even if you pay them double time they won’t work, their religion is their life. Mainly Hindu. Pilago: I sew, so this lady came up one time and said your dress is really beautiful, and I told her, I sewed it. She said, Have you ever thought about producing your own clothing, and I told her, I tried from home, I tried to sell from home but it wasn’t fun after a while you know when you have customers plus, I had a full time job. 2006 I went there, part of 2006, 2007 I started some small production. From there I didn’t really expand my company, just reinventing clothing and getting new art from my family and just starting printing and slowly I started growing. We started adding on more sewers, more printers, yeah, it started from there. Your family here and their family there?! Pilago: The printers, they have about maybe twenty people that work, and they do it all by hand. There’s another family that does the batik aspect of the design. The fabric, I go over there and I go to the fabric stores and I choose my fabric. And then I choose my colors. It’s the same people I’ve been working with for eight years. Pilago: Printed designs are mostly on the jersey, cotton jersey. And now they have digital, unbelievable they’re so state of the art. I’m printing some for MAMo, I’m trying it out. I took some pictures of the lava, so for MAMo I’m going to do all the bright colors of the lava, the yellows, reds, oranges. I had some digital prints of my photos so I’m pulling that out for MAMo this year. Pilago: It's going to be different. I don’t usually have a theme, I don’t know because I don’t know how to choreograph the stage. Robert them always scold me because I just tell them walk out do their thing, have fun! Pilago: And it’s so nice because we have a lot of new designers here in Hawai‘i. It’s so nice because now we can use our own people’s clothing. That’s the greatest part about fashion now. You can look around and it’s not by some place in the mainland, it’s somebody here from Hawai‘i who designed and created this piece we can wear now. It’s pretty exciting , so I’m excited about that and meeting all the new and upcoming designers. You know, just sharing stories and sharing hope, and wishing everybody the best because we work hard. We deserve it! Pilago has new prints based on her photographs of lava set for the MAMo Wearable Art Show this year. She has a new shipment of pieces coming for the trunk show at Marks' Garage after the runway show. 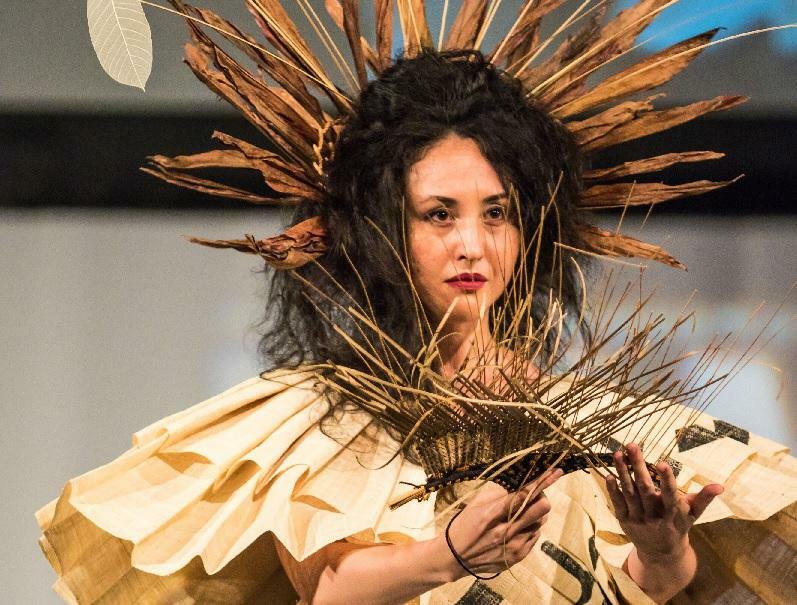 The first exhibition of Hawaiian feather work on the U.S. continent created a sensation when it opened at the de Young Museum in San Francisco last year. The exhibition of seventy five stunning capes and cloaks has been held over until April 10ththis year. Meanwhile, the return of Hawai‘i island Chief Kalaniopu’u’s feathered cloak and helmet have reignited interest in feather work here. 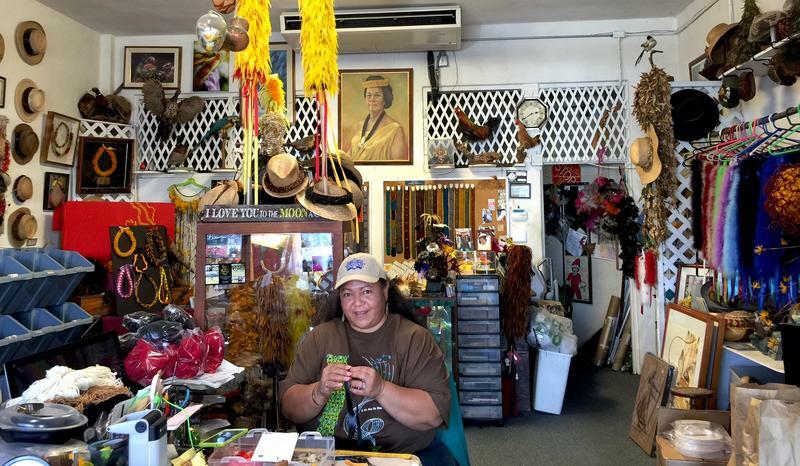 HPR’s Noe Tanigawa reports on how Hawaiian feather work was made. David Kuhn has spent over thirty years as a wildlife guide. As part of his own process learning Hawai‘i’s forest birds, Kuhn began recording them in the mid ‘90’s. 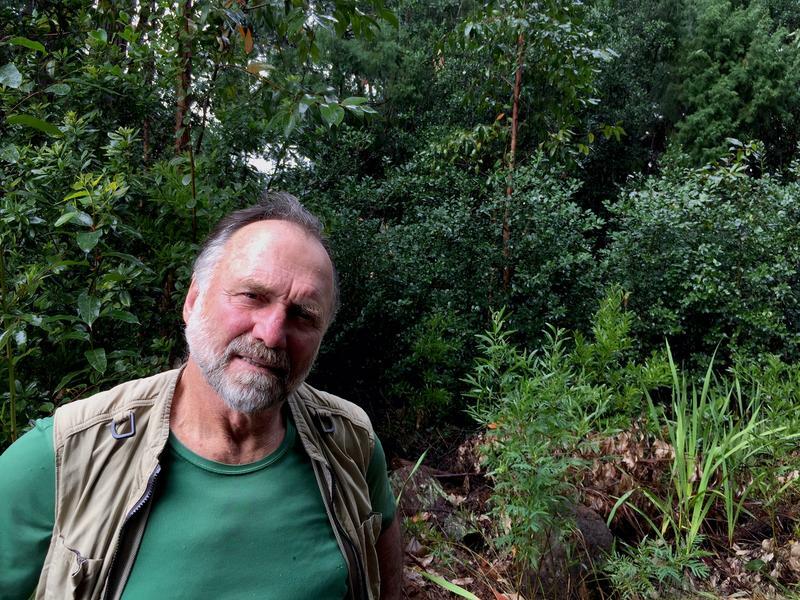 His audio library now encompasses birds, bats, crickets, whales, waters, and, importantly, the mixed sounds of forest biophanies that are rapidly disappearing. HPR’s Noe Tanigawa visited him in Kōke‘e on Kaua‘i.